The J.D. Kestner doll company made dolls in Germany, in the Waltershausen, Thuringia region, for over 90 years. The earliest dolls were wood and papier mache, and then China. But the dolls that the company is best known for are the bisque better known as porcelain dolls from the late 1800s into the early 1900s. The company produced dolls of many molds and types--the bisque dolls from the company included child dolls, character dolls, all-bisque dolls, lady dolls, baby dolls, and many others. The Kestner doll company started producing dolls in the 1820s (some say as early as 1810) and produced dolls until approximately 1938. Very little is known about the early history of Kestner Dolls--the company didn't start to mark dolls until well into the production of bisque dolls. It is known that Johann Daniel Kestner Jr. began producing papier mache and wood dolls at least as early as the early 1920s. The company's production changed with the times, and the doll factory produced china dolls, then bisque dolls, as tastes dictated. Johann died in 1858, and his grandson Adolf took over operations in 1863. Adolf died in 1918, and yet the company continued for another 20 years after. The Kestner factory was one of the biggest employers in the region. As mentioned, the original dolls were papier mache and wood. Then, china dolls (glazed porcelain) were made, and later, they produced bisque dolls. The Kestner doll factory was large, and Kestner made doll heads for many other companies as well. Kestner not only made doll heads, but they also made doll bodies of many types, which was unusual since many companies only made heads, or only made bodies in the 1800s. It is hard to pinpoint a "basic type" of Kestner doll since the company made so many. Collectors today are probably most familiar with the dolly-faced bisque dolls on composition bodies of the late 1800s to early 1900s (such as the 171 mold), baby dolls with composition bodies such as Hilda and the JDK babies, and shoulder-head dolls on kid bodies (turned shoulder head dolls and mold 154, etc). Kestner all-bisque dolls are also known for their quality and modeling. Early Kestner bisque dolls are just marked with a number or a size. Later dolls are usually well marked with the mold mark and Made in Germany; some of the baby dolls are marked JDK. There are many variations on Kestner marks. 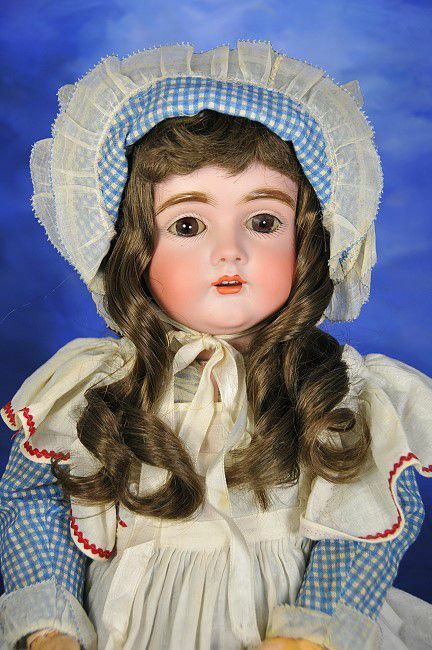 As with so many dolls recently, prices for very common dolls including shoulder head dolls and common molds are trending even or downward; prices for rarer molds, character dolls, lady dolls, and desirable baby dolls including Jean and Hilda (a common but popular mold) are even or trending upward.